On Friday, U.S. Commerce Secretary Penny Pritzker concluded her five-day trade mission in Monterrey, the largest business center in Mexico after Mexico City. Among her many trade mission events, Secretary Pritzker met with Margarita Arellanes Cervantes, Mayor of Monterrey, and Jose Luis Pier Castello, President of Lowe's Mexico - one of the leading hardware chains in the world - to highlight the importance of promoting corporate social responsibility and to recognize Lowe's and other American companies doing business in Mexico for their focus on these efforts. At a Lowe's store in Monterrey, Secretary Pritzker expressed her appreciation for employee volunteerism and acknowledged the importance of companies' involvement in the communities in which they operate. After Lowe's opened its first two stores in Monterrey in 2010, the company, began looking for ways to get involved in the Monterrey community. The company has since supported local schools with donations, volunteer time, and construction expertise. 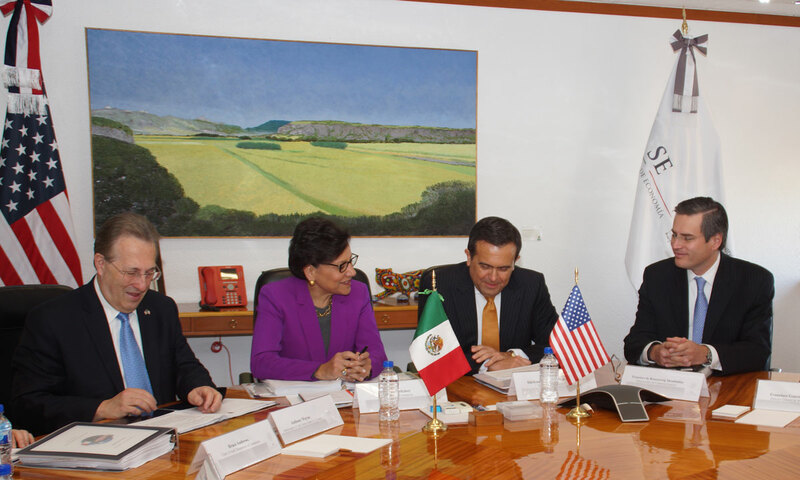 Secretary Pritzker said that Lowe's commitment to the Monterrey community reflects the values of many American companies that invest in Mexico, and that U.S. companies are committed to staying active in the region. In addition to meeting with Mexican government officials in Monterrey, Secretary Pritzker met with employees at the U.S. Consulate in Monterrey as well as the Department of Commerce’s Monterrey team, thanking them for their public service and for their assistance in promoting Mexican investment in the United States. Last week’s trade mission, which also included a visit to Mexico City, provided the 17-company business delegation with opportunities to establish relationships that will help promote their technologies and services in Mexico’s rapidly expanding infrastructure sector to support job creation in both countries. The mission also allowed Secretary Pritzker to focus on two of her main priorities as Commerce Secretary – helping U.S. businesses export goods and services and encouraging investment in the U.S.
Mexico is one of the United States’ largest trading partners, and the United States will continue building and strengthening relationships with its southern neighbor. Learn more about this trade mission, and read about other highlights of the Secretary’s trip, including her meetings with Mexican government officials, her speech at a breakfast event hosted by the American Chamber of Commerce and the Mexico-United States Entrepreneurship and Innovation Council (MUSEIC), and her remarks at the Mexico Chamber for Industrial Transformation of Nuevo Leon and Cintermex Luncheon. Secretary Pritzker’s next trade missions include trips to the Middle East from March 8-14 with stops in the United Arab Emirates, Saudi Arabia, and Qatar, and to West Africa May 18-23 with stops in Ghana and Nigeria.